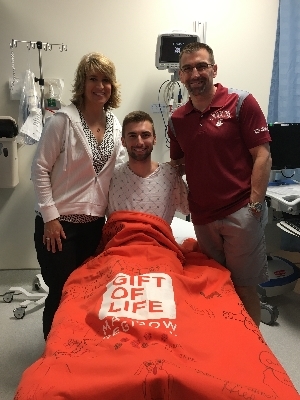 Gift of Life Campus Ambassador Aaron walked into Georgetown University Hospital at 6:15 a.m. a month ago hoping to save a life. He was there to donate bone marrow for a stranger, a boy suffering from a bone marrow disorder who needed a transplant to survive. “It was just before graduation, and I was at work when I got a call from Gift of Life,” said Aaron. “I remember them saying, ‘We want to let you know that you’ve matched someone, a young boy’ I said ‘I’d love to donate!’” Aaron already knew something about bone marrow transplants – he had served as a Campus Ambassador, so he not only understood how and why a transplant could save someone’s life, he had been explaining that process to others for two years. “For anyone out there who is wary of joining the registry because of the fear of this being a painful surgery, I can personally debunk that myth,” said Aaron. Aaron found Gift of Life’s Campus Ambassador Program online while looking for a college internship. As a major in cell biology and genetics, the organization’s mission caught his attention – matches are made based on genetically determined factors at the cellular level, right up Aaron’s alley. Ambassadors learn about the biology behind marrow transplants and are trained in how to set up, publicize and run donor recruitment drives on campus. These drives help bring young donors 18 to 25 into the registry, the exact demographic that transplant centers prefer for their patients. On his day of donation, Aaron and his parents went to the donation center where they were met by a Gift of Life coordinator who presented him with the trademark orange blanket signed with well wishes from staff members. “I was amazed at what people I had never met were writing – each note filled me with a feeling of warmth and support.” After consulting with the doctor, he was given general anesthesia and his marrow was drawn. In the weeks leading up to his donation, co-workers and friends had expressed some fears about the process to Aaron – but he is clear about how positive his experience was: this outpatient procedure was much easier than having his wisdom teeth removed, and “is nothing to be nervous about.” He woke up about an hour and a half later to hear some amazing news from the nurses – his marrow was so high in the number of cells needed for transplant, they were able to take a smaller amount of it. His thoughts are also on his recipient. “This is a way for a boy to live a happy, healthy and normal life, and for his family to finally heave a sigh of relief and know they are getting their son and grandson back.” Although they must remain anonymous to each other for now, Aaron hopes that someday he’ll be able to meet the boy and his family and see how their lives have improved. Aaron graduated recently, but since he works near the campus at a biotech company, he plans to help the current Campus Ambassadors. “Now I can answer people’s questions about donating from personal experience,” he said. He also offered some tips for future Ambassadors, “Be aggressively educational! A lot of people start to walk away when they hear you say bone marrow, so you need to step outside your comfort zone and teach them.” Aaron also pointed out that many minority populations in the United States don’t have the numbers of donors in the registry to find matches for everyone that needs one. College campuses are highly diverse, giving Ambassadors the opportunity to help change those numbers. In his free time, Aaron and other family members are often found enjoying nature while hiking, water skiing and kayaking. 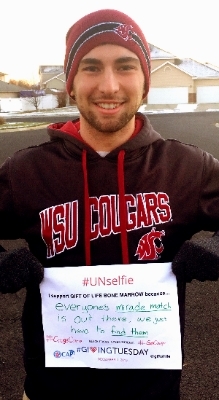 Thank you, Aaron, for being a heroic bone marrow donor and an amazing Campus Ambassador. We look forward to your future accomplishments with great anticipation! If you'd like to be part of an on-campus college internship where your work can actually save lives, visit the Campus Ambassador website to learn more.